Despite the peak of excellence modern music has achieved, we do not hear or see today the least sign of those effects which ancient music produced, which were so infinitely desirable and useful. Let me begin this essay with a few statements. I will then continue to elaborate on them and point out in what ways they are interrelated. The most important characteristic of high quality art music has always been and will always be the upliftment of the soul. Today there are hardly any living composers of Western art music whose music is at the same time generally well-known and loved by classical music loving audiences all over the world and of the same high quality as for instance the music of a Tchaikovsky or a Brahms. In fact, this is a very strange phenomenon, since a number of such extraordinarily gifted composers have always been around during the last centuries, and there is every reason to believe that this is the case also today. Classical music-loving people in general very much prefer art music from the past to contemporary art music. The repertoire that is being performed in concert halls and broadcasted by classical radio stations all over the world reflects this. Ultimately, it is solely for the reason mentioned above that contemporary art music is played far less frequently than art music from the past. This, too, is in fact a strange phenomenon. In the past, up until the second world war, newly composed art music was performed frequently, much more frequently than now, as a matter of course, and new compositions were anticipated with keen interest. Let’s start with examining the second of these statements, about music’s inherent capacity to ‘uplift the soul’. This may seem a somewhat vague expression. Nevertheless, it is quite generally used to describe great art. Let’s try to find out what is meant by ‘soul’ and what by ‘uplift’. Most people know the word soul only in a religious context. According to all world religions, the human soul is in fact our essence, the body being its cloak. Being immortal, this essence is said to leave the body when we die, going to a realm called the hereafter. Hardly anyone had doubts about this concept as long as Christian belief systems dominated Western society. But with the advance of Secularization people started to question all religious concepts, including the existence of the soul. The new leading principle became: everything that cannot measured with modern scientific means must be assumed not to exist. However, starting in the seventies of the last century, a number of scientists have appeared who claim to have scientific proof for the existence of the soul and an afterlife. The first one was Dr. Raymond Moody, whose book Life after Life was published in 1975. He invented the term Near-Death Experience or NDE to describe what people who were clinically dead but survived claim to have experienced while they were close to death. In The Netherlands, cardiologist Pim van Lommel asserted in his book Eindeloos Bewustzijn (Infinite Consciousness) (2007) that such experiences cannot be products of the brain, since the brain simply doesn’t function during an NDE. One of his conclusions therefore is that ‘there are good reasons to assume that our consciousness doesn’t always coincide with the functioning of our brain: it can also be experienced apart from our body.’ In his book Evidence of the Afterlife: The Science of Near-Death Experiences (2010), Dr. Jeffrey Long provides nine strong arguments to prove that there is indeed an afterlife, stating that the combination of these nine arguments prove this beyond the shadow of a doubt. All in all, it is my belief that the existence of the soul will be generally accepted before long. What can the word ‘uplift’ mean in connection with ‘soul’? This is difficult to describe in words, but easy to feel. Everyone knows the feeling one gets when one experiences something incredibly, indescribably beautiful. Everyone has felt how deeply gratifying such an experience can be. It is this characteristic of beautiful music that explains why we attach such an enormous importance to music during rituals that highlight highpoints of our existence: birth, marriage and death. Especially during such ceremonies, we realize that that uplifting music is not just pleasing, but that it goes much deeper than that. Not only do we deeply enjoy it, we also feel that it is in some way healthy for our souls: invigorating us, comforting us, helping us to process difficult experiences or to accept difficult circumstances, etc. ‘Uplifting’ music can thus be defined as music that gives us a deeply gratifying and healthy feeling of well-being. But there is more to this. In Japan, in the nineties, Dr. Masaru Emoto investigated the effects of external influences on water, among which the effects of different sorts of music. After exposing water to a specific external influence he froze it and examined the shape of the frozen crystals. Interestingly, those compositions that one might expect to have an uplifting effect on the human soul result in the most beautifully shaped ice crystals, as can be seen here: http://www.masaru-emoto.net/english/water-crystal.html. Very telling is the difference in crystals subjected to heavy metal music on the one hand and music by Mozart, Bach or the Beatles on the other. As the human body consists for three quarters of water, it is likely that different types of music will have similar effects on humans, too. Obviously, Emoto has been proclaimed a pseudo-scientist more than once, but new scientific models based on quantum physics, by scientists as Gregg Braden, Bruce Lipton and David Wilcock add logical reasoning to his findings. But even if you, dear reader, are of the opinion that Emoto, van Lommel, Braden and the others I mentioned are all pseudo-scientists, it is still possible that the others things I am stating here resonate with you. Let’s for the moment assume no more than that music influences the human mind. Then the following question presents itself: in what ways does what kind of music influence what kind of human minds? This is a question with a very wide range. In order to start saying something sensible about this, I once invented the terms outgoing effect and incoming effect of a certain piece of music; ‘outgoing’ defining the beginning and ‘incoming’ the end of a trajectory reaching from what a given piece of music ’emits’ while being performd to what the listener experiences while listening to it. Outgoing effect: on the one hand, we all realize that a certain piece of music has an effect which cannot be described in words but which is nonetheless specific for that particular piece. Incoming effect: on the other hand, we know that a performance of a certain piece of music can have very different effects on different people; and we also know that we ourselves can react very differently to one and the same recording, depending on our mood or the time of day. In other words: a certain musical fragment, performed a certain way, has a specific outgoing effect on listeners in general; however, the way this music ‘enters’ a certain listener differs from person to person, moment to moment, etc. In my opinion, it is the specific outgoing effect of a given piece of music that exclusively determines its artistic quality. It is this outgoing effect that is ultimately the only reason for the existence of the so-called ‘iron repertoire’, the large collection of works that withstood the filter of time. What these works have in common, is that they are generally believed to be of a very high quality. In some cases it can take a while before a consensus is reached. For example, during the first decades after his death, the music of Johann Sebastian Bach was considered rather too cerebral and old-fashioned, and therefore inferior to that of his sons Johann Christian and Carl Philip Emmanuel. Today we know better. Eventually, a consensus is reached, and invariably it is good music that survives. This phenomenon can only be explained by assuming that the outgoing effect of a given piece of music is endlessly more important than its incoming effect: how you or I as individuals experience it, let alone what you or I think of it. Could it be that there is a direct relationship between the outgoing effect of a given piece of music and its capacity to uplift the soul? When we reconsider what are the characteristics of music that people agree on to be elevating for the soul, it seems very likely that a deeply gratifying outgoing effect of a certain piece of music and its capacity to uplift the soul are actually one and the same thing. 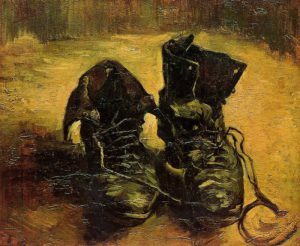 Van Gogh here succeeds in transforming objects we probably wouldn’t deign to look at in real life to something we gaze at in wonder of its beauty. It is this transformation process that is essential here, not the pair of shoes themselves. Not they are the work of art, but the painting is. In music, the horrible cry of Clytemnestra in Richard Strauss’ opera Elektra can serve as an example. In the context of soft scurrying runs in the strings and the audience anticipating Orest’s killing of his mother, this blood-curdling cry is highly effective and ‘beautiful’ in its own way. But when this cry would come halfway a tender adagio by Mozart, it would definitely not be experienced as beautiful, but on the contrary as extremely ugly, shocking and disturbing. It is the context that counts, and the artist’s ability to transform something ordinary or even ugly into something beautiful. In order words: the serene atmosphere of the adagio from Mozart’s clarinet concerto is beautiful, but so is the eerie, alienating atmosphere in Alban Berg’s Wozzeck. In this sense, I uphold the claim that great music will always be beautiful. Now if this is true, wouldn’t it be logical that everyone aspiring to be a composer of art music would above all else desire to learn how to compose beautiful, elevating music? That this ought to be the main theme of all textbooks about composing art music? If indeed music has the capacity to uplift the soul, what more can a young composer want than to learn how to write such music? On the one hand, in a society where only that which could be scientifically proven to exist was assumed to exist, materialism became more important, also in music. As a result of this attitude, during part of the twentieth century the focus of art music was primarily on investigating the four basic components that a tone consists of: its pitch, its duration, its degree of loudness and its timbre. The eventual result was called serialism, where these four components were all strictly organized by means of one and the same series of numbers. The idea behind this was to impose so much mathematical order on the composition that the human element was all but eliminated. In 1958, the American serialist composer Milton Babbitt wrote an essay with the telling title Who Cares If You Listen?, a title that very well expresses the attitude of those days’ avant-garde composers toward their listeners; an attitude far removed from any desire to take into account the outgoing effect of music. Alongside this attitude, the concept arose of the genius ahead of his time, whose music would only be fully understood and appreciated by future generations. Reversely, contemporary music that did have popular appeal could be dismissed as not being ahead of its time and therefore not good. In short: this attitude could only result in alienating audiences from this kind of art. According to the current ‘originality’ doctrine, a contemporary composer of art music has above all to be ‘original’ or ‘innovative’, in the sense that in his work traces of historical predecessors have to be eradicated. A contemporary composer has achieved the apex of ‘originality’ when his or her music is ‘completely new’, when it doesn’t look like music from anyone else, especially not like music from historical predecessors. All too often, being ‘original’ means nothing more than wanting to be different just for the sake of being different. When this is the first and foremost criterion for greatness in art, there isn’t much of a stimulus to learn and apply any rules. Following them would amount to being conventional, why then take the trouble of learning them? Indeed in art, even already in art education, imitation is often regarded with scorn, despite the fact that imitating is a crucial element in any learning process. The result is that in many conservatories all over the world, the aspect of craftsmanship in the education of composing art music has fallen into sharp decline. The very word ‘original’, however, is derived from the word ‘origin’, implying that there is a connection with a source. The whole essay can be read here: busoni’s garden. We have had confusing times behind us, and the confusion isn’t over yet. In the essay Busoni’s Garden I describe how in 2006 I succeeded in fooling two independent expert advisory committees ‘using compositional quality as the primary criterion in reviewing all applications‘, in letting them judge a composition that looks like an avant-garde score, but is in fact the result of two of my children banging away on my keyboard. This ‘Bubbles Experiment’, as I have named it, can be watched here: https://www.youtube.com/watch?v=EkWyKMiTdzQ (search terms: Comitas bubbles experiment). It clearly demonstrates how erratic adjudication of compositional quality can be nowadays regarding contemporary art music, ever since general views on what actually defines good art have gone astray. Small wonder, when one considers that someone like John Cage, who as far as I know never displayed any compositional talent by standards of the past, could become world famous, more famous than for instance the Russian composer Rodion Shchedrin (b. 1932), who by the same standards already at age 23 demonstrated true genius with his ballet The Humpbacked Horse. To sum up this part of the essay: there has for some time been a tendency to dismiss the effect of art music on the listener as unimportant while at the same time a god-like status of the composer as an ‘original’ or ‘innovative’ artist went hand in hand with a decline in craftsmanship. As a result, many classical music-loving people became indifferent to modern art music. However, since the seventies, when I started my composition studies, there has been a gradual change away from this rather odd perception. In the seventies many people still defended the thesis that the work of art in itself, the ‘thing’ itself, was what counted, not its effect on the listener or spectator. It was the ultimate consequence of materialistic thinking. In the eighties, however, the slogan, at least in my surroundings, became: the important thing is that it works (please note the subtle difference with: the important thing is how it works). Even today, it is still sometimes proclaimed in art circles that art has to shock people, has to shake people awake, etc. I remember an American art photographer causing quite a stir with a photograph of a woman peeing into a man’s mouth. Or a frozen sculpture of a Bristish sculptor’s own head, created from several litres of the artist’s own blood and causing waves of disgust when it was exhibited. If indeed it is the aim of art to shock people, then these objects are great works of art. The more people express their disgust at them, the greater becomes their artistic value. Since after the second world war ‘avant-garde’ music reached its apex with overly complex and one-sidedly cerebral compositions, there has been a reaction into the opposite direction. In America minimalism arose, with Steve Reich and Philip Glass as its protagonists, and Eastern Europe became the cradle of a trend that is sometimes called new spiritualism, with composers like Arvo Pärt and Henryk Górecki. In their compositions there is a lot of repetition, little development and hardly any modulating from one key to another one, if at all. Both trends have in common that they appeal very much more to feeling than to the intellect, and also that they have gained a lot of popularity. And then there are also so-called ‘cross-over’ composers: composers who in their music combine elements from ‘serious’ art music with elements from so-called ‘light’ music: pop and jazz. All these composers do take into account the desires of audiences without being criticized for this, which can be seen as a step forward. Parallel to this, we also see more and symphony orchestras programming arrangements of pop music, film music scores, etc. But there is something tricky there. Let’s return to my second question: to what extent is the outgoing effect or the capacity to elevate the soul taken into account in contemporary music? Let’s now have a look at so-called ‘light’ or ‘popular’ music. This vast range of musical types can be seen as originating from folk music of previous centuries. For this reason, ‘light’ music is often disregarded in music history textbooks, even though much of it has an artistic quality certainly no less than let’s say songs by Carl Zelter, a contemporary of Franz Schubert, known for his settings of poems by Goethe. Leonard Bernstein even went as far as stating that Lennon and McCartney were the greatest songwriters after Schubert. Whether or not this statement is hyperbolic, it is a fact that the music of the Beatles is still very much alive and admired today. But, even so, it is true that most ‘light’ music can hardly be considered art. If there is music that is healthy for the human soul, as I stated earlier, then there will probably also be music that has an unhealthy influence on it; that doesn’t uplift the soul, but on the contrary drags it down. In relation to this subject, it is interesting to see what the founder of Anthroposophy Rudolf Steiner (1861 – 1925) had to say about the influence of music on the human body and spirit. Steiner divided the body in an upper pole, a middle area and a lower pole. The upper pole (head) is related to thinking, the cognitive, and as far as music is concerned, to melody; the middle part (heart) to feeling, in a musical sense to harmony; the lower pole (sexual organs and legs) to will and action, musically speaking to measure and rhythm. With this in mind, I once went to a disco, long ago in 1984—I was still a student. (I had earplugs in, in order to better to be able to hear the music.) What struck me was that all music I heard during the entire evening was in four quarter beat, with a tempo of 116 beats per minute. The melodies were predominantly pentatonic (using a scale corresponding with the black keys of a keyboard) and there was very little variety in chords. What caught the ear what with rhythms was that the many syncopations (accents just before the beat) were accompanied by permanent heavy accents on the second and fourth beats of the bar. The overall effect was very booming-monotonous. But apparently this music met a certain need. The pounding rhythm was hammering the visitors into a sort of drugged trance state. The almost complete lack of melody and of diversity in harmonies reinforced this: it didn’t stimulate anyone to really listen to the music. To describe the experience in antroposophic terms: the upper pole and middle region were stunned: as a result of the lack of melody there was no appeal to the intellect, nor was there any appeal to the heart region, due to the lack of diversity in chords; and the ongoing syncopated rhythms, combined with the merciless pounding on the second and fourth beats of nearly each measure functioned as dope for the lower pole, appealing to will and action only. Soldier 1: War happens and the fighting starts, you know, and it’s kinda like we’re pumped up ‘n motivated, ready to go. Soldier 2: It’s the ultimate rush. ‘Cause you know you’re goin’ into the fight to begin with. And then you got a good song playin’ in the background. And uh that, that gets you real fired up. Ready to do the job. Soldier 3: You can hook your CD player up to the tanks’ internal communication system. Say when you put your helmet on, you can hear it through the helmet. Soldier 4: This is the one we listen to the most. This is the one we play when we kill the enemy. Drowning Pool: ‘Let The Bodies Hit The Floor’. Just fittin’ for the job we were doin’. Needless to say that I consider ‘Let The Bodies Hit The Floor’ a good example of unhealthy music, just like The Roof is On Fire, that is presented as another song fittin’ for the job. Please judge for yourselves. And, if you like, please compare the effect of these songs with the effect of Let us sleep now, the closing section of Benjamin Britten’s War Requiem, his masterly musical manifesto for pacifism. In short: it seems likely that there is indeed such a thing as music that is detrimental for the soul. The picture of the ugly looking water crystals subjected to heavy metal music on the Masaru Emoto webpage mentioned above corresponds with this. I’m convinced that future scientific investigations will bring to light much more about this subject, and that the process of shedding light on it will be vastly accelerated once the existence of for instance chakras and meridians is acknowledged in mainstream science—see the Tesla quote preceding this essay. In the field of ‘light’ music, big economic interests are often at stake. As a result of this, a lot of music is being produced that meets the demand for immediate satisfaction. Such less-than-healthy music sells very well, just like alcoholic beverages, sweets, cigarettes, etc. Now please don’t get me wrong: I’m not moralizing, only stating. It’s fine with me that cigarettes are being manufactured and sold, and I am happy that everyone knows and accepts the fact that many people enjoy smoking them, but that this isn’t good for them, nonetheless. Where I do have a problem, though, is when something that isn’t good is being promoted as if it were good. And this has happened every now and then, also in the world of art music. It’s time to return to the two basic questions of this essay: 1) in what ways does what kind of music influence what kind of human minds? And: 2) to what extent is the outgoing effect or the capacity to elevate the soul taken into account in contemporary music? The quality of a given piece of music is solely determined by its outgoing effect. Good music is good music because it has the capacity to uplift the soul. Good music can be called healthy. There is also unhealthy music: music that has the capacity to drag the soul down. The so-called ‘iron repertoire’ consists of high quality compositions that have withstood the filter of time. They have withstood the filter of time because of their capacity to elevate the soul. Here is the tricky thing I mentioned earlier: crazy as the claim of some avant-garde composers from the past may have been that whatever is popular cannot be good, the reverse also isn’t true. The fact that many people find something appealing, pleasing and/or beautiful doesn’t automatically mean that this something is good. This goes among other things for television programs, magazines and food products, and it also goes for music. Obviously, most pop music isn’t good art, nor is it meant to be, at least in those cases where its aim is to meet people’s demand for what they crave for. As I pointed out, the more primitive pop music aims more at appealing to ‘willing and action’ (in Steiner’s vision corresponding with the lower part of the body) than to feeling and intellect. However, I had already stated that something similar can be said about respected art music trends as minimalism and new spirituality: such music, too, doesn’t do much of an than to intellect. Contrary, however, to the more primitive pop music, such music appeals all the more to feeling. I claimed that high quality art music, music with a high quality outgoing effect, is in fact the same as music that is healthy and uplifting for the soul. What I would like to state now is that truly great compositions provide rich and healthy nourishment for both intellect and feeling. Take any great composer from the past, whose music now is part of the ‘iron repertoire’, as an example. In their compositions you will always find the traces of a high degree of intuitive musical super-intelligence combined with a high degree of beauty on an emotional level. Musical analysis that is at once intuitive and intelligent will always bring this to light. If this goes for music from the ‘iron repertoire’, then it will also be a conditio sine qua non for contemporary art music that aspires to be of a high quality. This automatically implies that most minimal, ‘new spiritual’ or ‘cross-over’ music will fall short of such high demands, popular and beautifully sounding as such music may be. Even so, history has shown that music can both be good and popular in its own time. Several Mozart operas were extremely popular during the composer’s lifetime. Händel, Rossini, Verdi, Liszt, Shostakovich, Britten, they are just some examples of composers who were immensely popular during their lives, at least in their own countries or in the countries they were residing in. And Leonard Bernstein’s West Side Story is a perfect example of a great work of cross-over art music, richly nourishing both feeling and intellect, that has been immensely popular ever since its premiere in 1957. It is my opinion that it is the rich and healthy nourishment for both intellect and feeling, as described above, that accounts for the fact that listening to it is uplifting for the soul; and it is precisely this nourishment that is missing in so much contemporary art music from the last six or so decades. It is exclusively for this reason that the repertory of symphony orchestras and opera companies all over the world has become ossified to the degree that it has, relying for the most part on music from Bach to Britten. That this actually is a strange and unnatural phenomenon, is underlined not only by the fact that in earlier times music from the own epoch was performed on a wide scale, but also by the fact that this is still the case today, when one doesn’t concentrate on art music alone, but includes ‘light music’ as well. It is only natural that people feel the desire to listen to music of their own time, as a piece of music always reflects the time of its creation. Furthermore, it is my opinion that also today there are a number of composers alive whose talents can be compared to those of for instance a Brahms or a Tchaikovsky. However, there is the danger that the current, twisted ‘originality’ dogma prevents them from reaching their fullest potential; or there is the danger that they are drawn into one of the many sorts of ‘light’ music -and for simplicity’s sake I count film music and musical among them – where part of their innate talents will perhaps not be needed and therefore not fully developed. Art music has always been the exclusive preserve of an elite. This was the case in the days of Mozart and it is still the case today: there are many people who much prefer listening to for instance house music to listening to the music of Mozart. People who genuinely love classical music belong to this elite. A number of 20th-century avant-garde composers and their following wanted us to believe that belonging to such an elite were an intellectual achievement: the public at large needed to be ‘educated’ in order to rise to the level needed to appreciate their music. However, the very fact that it is the best music that enters the ‘iron repertoire’ implies that in the end the ‘general public’, consisting of people that truly love classical music, is right. When it consistently doesn’t embrace certain forms of art music over a long period of time, as has happened with for instance the avant-garde’ music of the sixties, then the only logical conclusion can be that it is the music that falls short, not the public. It seems more likely that the elitist aspect of art music is to be found in the realm of spirituality. In order to be capable of deeply undergoing and enjoying the wholesome effect of the great works of for instance Mozart, it is necessary that one’s soul has reached a certain level. Mozart’s works form an example of music on a very high spiritual level, house and heavy metal music on the contrary form a good example of music with a low spiritual level. Masaru Emoto’s water crystal pictures also seem to demonstrate this. In between both extremes, there is an enormously vast scope of types of music, each with its own ‘vibration’, appealing to different kinds of people who resonate with a particular vibration. Which type of music resonates with which type of person has everything to do with what I termed the ‘incoming effect’ of music: how it ‘enters’ different people. A person’s spiritual level is what determines to what extent he or she can experience the uplifting quality of uplifting music; or, on the other hand, to what extent he or she is attracted by less-than-healthy music. Again, I don’t make this statement in order to moralize, nor would I want to measure, as it were, the spiritual level of the many types of music that exists. I just aim at stating things as they are, in my view. Art has everything to do with enjoyment, so let’s above all else enjoy it. In the field of art music there has been a time when this aspect was completely disregarded, which resulted in alienating classical music-loving audiences from what at the time was being termed ‘avant-garde’ music. In reaction to this, trends like minimalism, new spiritualism and ‘cross-over‘ music have emerged where the aim again is to please certain audiences, albeit at the expense of the spiritual level that had been the major characteristic of great art music in the past. In popular music, however, attaining a high spiritual level has never been the primary goal. In folk music of the past, the primary goal has always been simply to give us the blessing of amusing us, and where pop music has become big business, the primary goal usually is to earn money. Even so, there is pop music that is much more uplifting to the soul than a lot of more or less modern music pieces currently considered art music. Lennon & McCartney’s great song Eleanor Rigby is just one example of many. I absolutely agree with Bernstein that they were truly great songwriters, at least during the days of the Beatles, when their combined talents were supplemented by George Martin’s wonderful arranging skills. As an appendix, I would like to express my firm belief in a bright future of art music. Once we realize that dogma’s about what is allowed or forbidden in contemporary art music are nothing but twisted ideas in our heads, they will evaporate, allowing true musical genius to fully blossom again. Textbooks on composing will primarily focus on the outgoing effect of music, on universal laws regarding this and on the means that a composer has at his disposal in order to compose music that is uplifting for the soul. With the exception of human thoughts, by the way. Possibly, the shape of water crystals is influenced by the degree of beauty of the sound itself, rather than by the musical structure of a composition. In other words: though ugly crystals may well be an indication of ‘unhealthy’ music (see further on in this essay), beautiful structures may not automatically imply high quality art music. This isn’t to say that the reverse is also true: that music that does not survive will always be inferior music. On the contrary: there is a lot of wonderful music still waiting to be discovered. Let me mention Edward Lowinsky’s brilliant article On Mozart Rhythm, Charles Rosen’s outstanding book The Classical Style and Ernst W. Mulder’s critical analysis of Mahler’s Das Lied von der Erde as some examples of writings where such intelligent analyzing can be found. Obviously, the score of the Sacre is the result of lots of ‘tinkering’, especially with Lithouanian folk melodies as one of its main sources. However, to my feeling this doesn’t contradict Strawinsky’s statement. ‘Tinkering’ being an essential element in my own composing, too, I have a similar sensation of being a vessel through which the music flows, as soon as inspiration starts to flow.